For days when your emotions are bubbling up and you don’t know how to contain yourself. I suggest this omelette. Two fillings – because why settle for one. And make them look like they are exploding out of the omelette like they are eager to meet your taste buds before the eggs. A little grated cheddar cheese. Saute onions an then mushrooms. Add Salt an pepper. Add garlic an saute further for one minute. Add chopped red pepper and cook for 3 minutes. Add a little olive oil to a small frying pan. Add to hot oil spreading eggs to create an even circle. Spread a little mustard for extra kick. 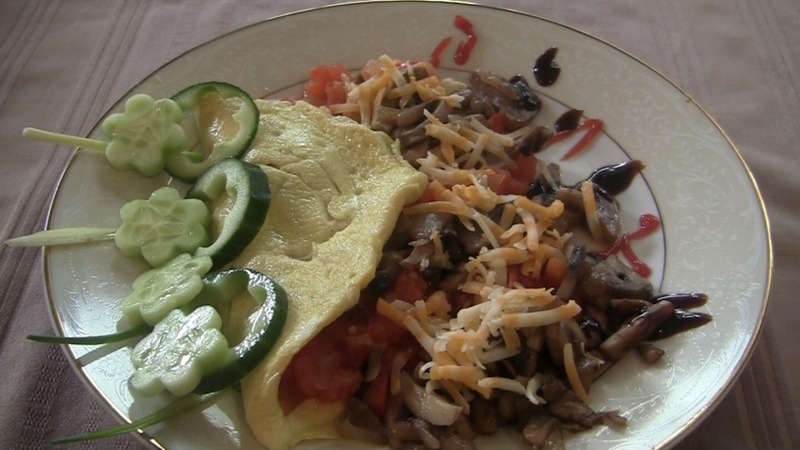 Place alternating rows of tomato an mushroom fillings as if exploding out of the omelette. Garnish with ketchup, balsamic reduction, cheese, cucumber an green onion.